Now that Pinky is three I’ve been starting to teach her the basics in a more structured way at home. She’s got a good head start – she knows her ABC’s and can count to twenty and is getting better with colors. Next year she’ll be starting preschool and I want to get her a head start. So, when Lakeshore Learning asked me to review one of their at home learning products I knew it’d be a great opportunity for us to continue her learning progress. I have a Lakeshore Learning store near my home but I always thought it was only for teachers. Well, it’s not! Lakeshore is launching the Learning at Home collection of products in-stores at all 57 Lakeshore Learning Stores! Anyone can shop there and there are TONS of toys, activities and learning tools for kids both in the classroom and right at home. 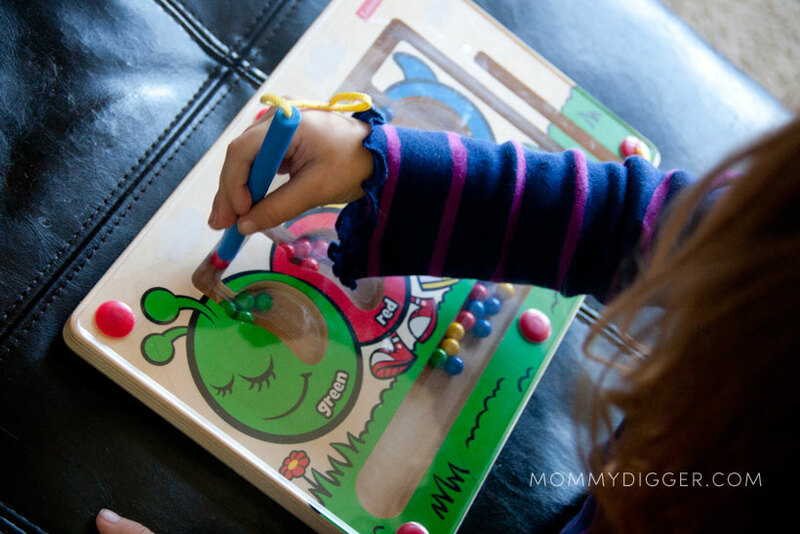 We reviewed the Lakeshore Learning Colorpillar Magnetic Maze. The object of the Colorpillar Magnetic Maze is to drop each of the little balls into each of their matching color sections using the magnetic tip pen. The cute caterpillar has 4 color sections – green, red, yellow and blue and there are a bunch of corresponding balls in these same colors to match up. The magnetic pen is easy for Pinky to use and guide the balls through the maze into their colored sections. Sometimes, the magnetic pen grabs two or three balls at a time though but I like it because it gives her a little problem solving to figure out how to get them into their sections correctly. I love this toy because it’s helping to teach her colors, she matches them all up wonderfully now and is learning what color is which. It’s perfect for home and great for on-the-go because it’s all contained with a permanent seal and the pen can be stored in the pen slot. If you’re looking for a great learning game I would definitely recommend the Colorpillar Magnetic Maze. For all the latest product news, updates and sales connect with Lakeshore Learning on Facebook, Twitter and Pinterest. BUY IT: The Colorpillar Magnetic Maze and other great educational games and activities are available at www.lakeshorelearning.com and in Lakeshore Learning stores for $19.99. Plus, by using this link you’ll recieve a 20% OFF coupon! I have never seen this. I love it and will keep them busy! We are working on colors, numbers and the alphabet. I think Abagail would love this. It’s great for colors and you could use it to help with counting too! I have seen toys similar to this, but I’ve never bought any for my daughter. It seems like something she would love! My nephews will love this. I am definitely buying this. This is amazing! Toddler would absolutely love sorting the colors. looks like fun for all ages. A learning at home collection is a great idea. Educational toys are wonderful. They help kids learn the basics in a fun way and get them on the right track for starting school. You get hand-eye coordination, colors, and understanding instructions all in one fun activity. This would be a great little item for my two preschool aged grandsons. How neat! Adding to my gift buying list. I had been looking for a color sorter from the longest time and this one I really have my heart set on, is the 20% off only online and if I can use it in stores how do I claim it? I believe it is online only but they do send out catalogs and coupons in the mail!